You might have heard about certified diamonds, what exactly does diamond certification mean and is it really necessary. Diamonds are rare, precious and expensive – a one carat diamond could cost anywhere from 2,000 USD to 10,000 USD. And to give you a perspective of that weight, one gram is the equivalent of 5 carats! So what is it in a diamond that defines its price, given the huge price range for diamonds with the same size, weight and cut, understanding the grading of diamonds is an important issue. The famous 4Cs are the parameters that largely influence the price of a diamond. Carat, color, cut and clarity are referred to as the 4Cs. And who defines these parameters for each diamond, the answer is quite interesting. A diamond seller could inspect a diamond and assess its ‘grade’. Such a process could be quite subjective as, different sellers might grade the same diamond differently. This process has been in use for decades especially when, small diamonds in the 1mm to 4mm sizes are involved. Diamond certification is a process that adds a significant degree of accuracy to diamond grading. To begin with the certifying authority or laboratory as they are commonly known, should be independent, unbiased and impartial. Do a casual search on Google and you will find dozens of diamond testing labs. The fact is that there are no more than 6 to 8 testing labs that are globally recognized. Much of the diamond trade that is conducted functions across borders, this makes it necessary to work with internationally recognized diamond testing labs. A diamond certificate would ideally be issued for a single diamond, it would clearly state the Color, Clarity, Cut and Carat weight of the stone. In reality, these parameters have been stringently defined by diamond experts, there is no room for hunches and guess work. Once tested, the diamond is assigned a unique number that can be checked and verified from anywhere on the globe. Some labs have an option where the grade of the diamond or the certificate number, can be microscopically etched on the side edge (girdle) of the stone. Diamond trade obviously involves the buying and selling of the precious stone. Limiting trade to certified diamonds, has a positive impact on prospective buyers. By accessing information disclosed on the certificate, a buyer with little or no knowledge about diamonds could make a purchase confidently. It is quite common for professional diamond buyers to first, inspect the certificate and then consider having a look at the actual stone. As expected, the certification of a diamond costs money, this might not be a big issue when the stone being tested has a substantial price tag. 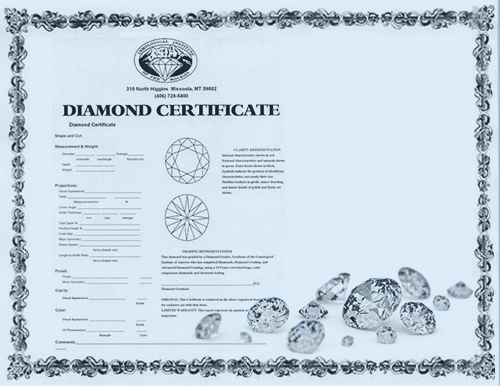 Certified diamonds command a premium price and the amount of the premium, clearly exceeds the cost of the certification. This report would be incomplete without talking about, diamond certification and authenticity of the stone. So are all certified diamonds natural, the answer would be YES until some ago but, that has changed now. Synthetic or lab created diamonds, have entered the markets and they do seem to be garnering a lot of interest. GIA which is probably the most trusted diamond testing lab with offices in almost every country, has decided to certify synthetic diamonds. While the same 4Cs criteria will apply to synthetic diamonds – the certificate would disclose that the stone is not natural but man made. Expect other testing labs to offer similar services. Glitzkoin: As the first diamond blockchain to be promoted by an insider from the multibillion dollar diamond industry, the Glitzkoin project includes a comprehensive diamond trading platform – DiaEx. The platform supports both, B2B and B2C trade in the glittering stone. The project is focused on boosting market share for natural diamonds and improving, productivity in the 90 billion dollar industry. Diamond listings on DiaEx, are limited to certified natural diamonds – no synthetics and no fakes. The Glitzkoin GTN token is the designated mode of payment on the DiaEx trading platform. The Glitzkoin ICO was completed in June 2018 with a GTN price in the range of $0.15 to $0.20. The token currently trades on the Stellarport exchange at a token price of $0.30. This happens to be a hefty 50% above its ICO closing price.